John Calhoun, who would gain notoriety as a leader of proslavery partisans in Kansas Territory during the 1850s, was born on October 14, 1806, in Boston, Massachusetts. He studied law in New York state and then moved in 1830 to Springfield, Illinois. While in Illinois he became a surveyor and served in the military during the Black Hawk War. As surveyor and soldier he met and became a friend of Abraham Lincoln. His Illinois political career included being elected to the state legislature in 1838, serving as clerk of the state house of representatives from 1839 to 1841, serving as clerk to the circuit court of Sangamon County, and being elected three times as mayor of Springfield. He was politically aligned with the Democratic Party and a strong supporter of Stephen A. Douglas and his “popular sovereignty” solution to territorial expansion. Through Douglas's personal influence, President Franklin Pierce appointed Calhoun surveyor general of Kansas and Nebraska in 1854. This position offered Calhoun prominence within the new territory, as his office was one with a large staff and a lucrative budget. During frequent absences of the territorial governor, the surveyor general exercised gubernatorial powers, and also served as a liaison between federal and territorial officials. As Kansas's most prominent Democrat, Calhoun sought to secure a majority for his party in the territory and promoted the popular sovereignty solution to the slavery issue. In 1857 he attended the Lecompton Constitutional Convention as a delegate and was made president of that organized body. The radical proslavery delegates attending the convention were determined to adopt a proslavery constitution and send it directly to the U.S. Congress without a popular vote. Calhoun and the moderate delegates urged submission of the constitution to the populace of the territory to win ratification and then submittal to the U.S. Congress for final adoption. A struggle ensued between the two rival factions of the convention, and in the end a compromise solution was reached whereby article seven legalizing slavery in the constitution would be submitted to a popular vote, thus assuring the survival of the remainder of the constitution, regardless of outcome of the referendum. The vote of December 21, 1857, became an election centering on inclusion or exclusion of the slavery article in the constitution. The free-state majority in the territory refused to vote, and the “constitution with slavery” won by a large margin. The Lecompton Constitution was rejected in a second vote on January 4, 1858, in which free-staters participated. Final rejection by the voters of this constitution came on August 2,1858. By 1858 control of the Kansas territorial legislature had passed firmly into free-state hands. The legislature initiated an investigation into the alleged fraudulent practices of the December 1857 election. This action prompted Calhoun to leave Kansas for the safety of Missouri. His unpopularity within Kansas eventually led President James Buchanan to relocate the surveyor general's office from Lecompton to Nebraska City. 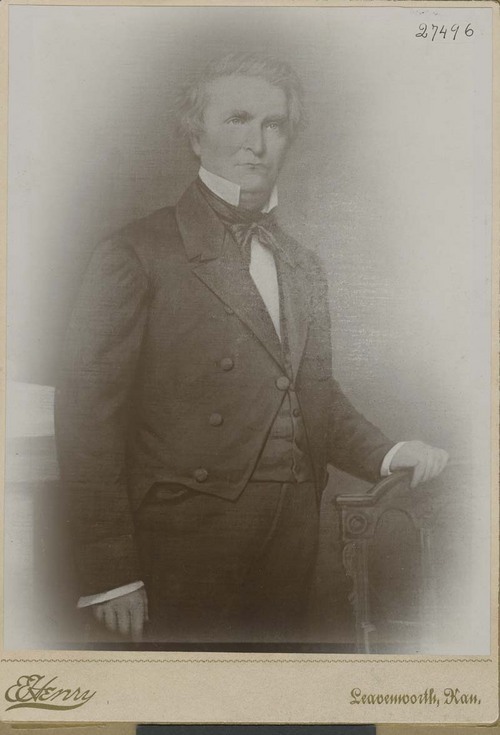 On October 13, 1859, Calhoun's career and personal involvement in the politics of Kansas came to an abrupt ended with his unexpected death at St. Joseph, Missouri. Dictionary of American Biography. New York: Charles Scribner's Sons, 1929. McDonald, Archie P. Encyclopedia USA. Gulf Breeze, FL: Academic International Press, 1986. Stampp, Kenneth M. America in 1857 . New York: Oxford University Press, 1990.